I just wanted to thank everyone for their kind messages and words regarding my ER visit the other day. Thankfully my dizzy spells are over and I can get back to my normal review and update schedule! I’m not big fan of waffles, especially the freezer kind, but I’ll make an exception for interesting flavors. (Like the pumpkin spiced waffles released every fall.) Eggo released this smore’s variety for summer 2013, which is pretty interesting, so I grabbed a box at Target. The box doesn’t look too special, if they hadn’t advertized these in store and put them in a special end-cap freezer I might have walked right past these. There are some chocolatey stripes at the top of box with a little “Seasons Limited Edition” blurb. 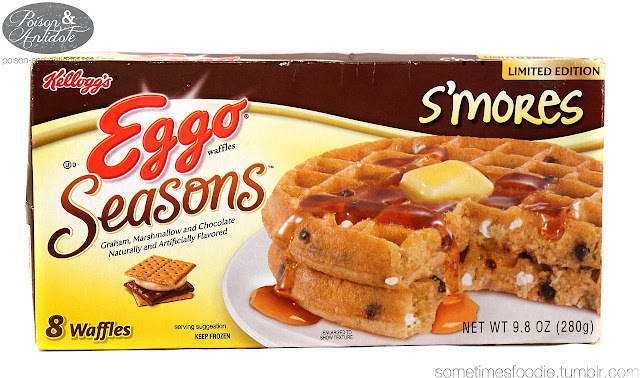 Visually, I think the design is appealing and the photograph of the waffles tempting, but the box doesn’t stand out against a sea of the other frozen Eggo flavors. I wish they had a drastically different colored box or something to help these seasonal flavors stand out. Frozen, the waffles look a lot like the pumpkin spiced variety. The waffle dough has a spiced look to it, which might be graham cracker related, and there are tiny specks that indicate marshmallow and chocolate bits inside. When toasted, these smell sweet with a mildly chocolatey aroma. 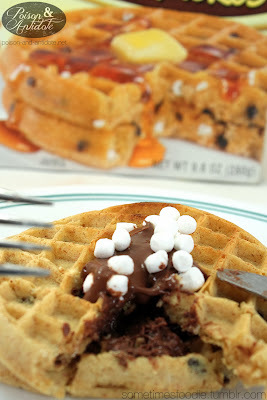 Overall these waffles are pretty yummy, but alone they don’t have a strong marshmallow or graham cracker flavor. 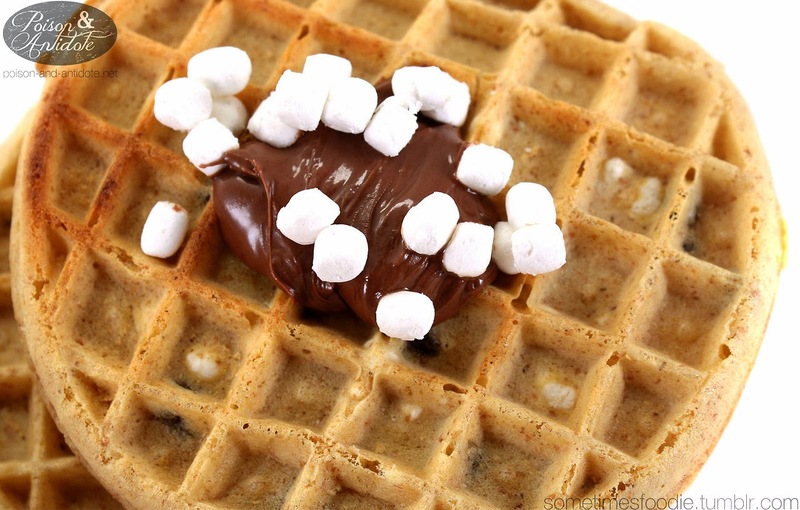 (I think that graham flour was used in the waffle batter, but the flavoring is pretty mild.) The Nutella and marshmallows I added really upped the s’more flavor, so I’d recommend eating these with chocolate or marshmallow flavored toppings instead of the traditional butter and syrup. I enjoyed this summery flavor, and I can see these waffles being really yummy for waffle ice cream sandwiches, but I don’t like this as a breakfast item.